Sometimes, books that I revisit help me understand how much I’ve changed, grown, or fallen back over the years. When I first attempted to read this book, several years back, I was a wide-eyed teenager who lived in her bubble of idealism. I found the writing to be choppy, and the story to be disturbing. It bothered my world-view of moral-idealism, and I abandoned the book. Last week, years later, the book had stared at me from an abandoned bookshelf. On a whim, I decided to read it again till the very end, only to discover how much I have changed, and how much I haven’t. Rahel and Estha are fraternal twins snared in a web of complications weaved expertly by the big strong adults of their world. Their childhood is ruthlessly entangled in society’s biggest issues, the most vociferous debates, when all they tried to do was indulge themselves in the small pleasures of childhood. 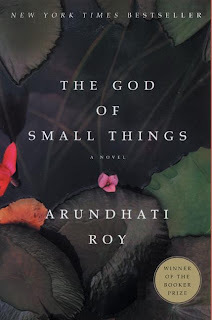 It is this perspective - how the small and big issues of life coalesce and drastically alter the course of small things, while hardly creating a ripple in the big things, that puts this book in its special place. It is the age-old discussion of individual versus community, and how the individuals always lose out, unwittingly, innocently. The twins are born out of the unfortunate union of a Malayali Syrian Christian mom, and a Bengali dad, both of whom have their own personal scars and misgivings. Their intentions were masked by impulse and rash hope, only to soon wither away as reality shined through. The twins and their mom, Ammu, are forced to seek refuge in Ammu’s home in Ayemenem, Kerala. An eloped daughter, divorced, with two children, returning home in disgrace, forms the exemplar of ridicule and forced-humiliation for the Ayemenem household members, who view themselves as staunch upholders of morality. Ammu and the children struggle to find their place in the household and in the community, but in vain. They hunger for love and acceptance. Each is caught in their own suffocating insecurity of their bleak future. Like a pile of dried leaves, their insecurities slowly mount from little incidents, which by themselves might seem insignificant. However, driven to the edge, they take a daring little step to reach out for love, only to dearly pay an incredibly torturous price. Roy fiercely brings to life the hypocrisies of the Indian society, especially, in the 60s, when Communism was at its incipient, boisterous stages in Kerala. Notions of equality and freedom did not fit with the community’s model of a moral society. Morality was a vacuous term, muddled by people’s distorted beliefs and bloated egos. Each person was tainted by his own selfish agendas, rationalizing them as being moral and for the greater good. Such a society, clouded by prejudice, deems who can be touched, and who cannot be. And what their role in society ought to be. Even as communism burgeons, there is a double-standard on who is worthy of its principles, and how much of it. This becomes the moral-mantra to base all their rational and irrational deeds. I never expected this book to leave such an intense emotional impact on me. The mix of heady emotions overwhelmed me so much, that I had to wait for a few days to write this post. In some ways, I still am that wide-eyed girl, hoping for harmony and kindness in every path that humanity takes. It still pains me to see the remnants of colonialism and caste-distinctions wreaking havoc in personal lives, and individual happiness. It pains me even more when children are mercilessly involved in cruel, complicated, moral dilemmas. It isn’t fair that their lives are scarred irreparably due to moral implications beyond their grasp of understanding. From a child’s lens, everything is simplified and seen for what it truly is. If only adults could simplify, and experience the smaller, delicate things in life that build up to the bigger causes. What a refreshing objective it would provide. This time, I found the writing to be deeply moving, and incredibly imaginative. It a took me awhile to connect with the writing style, but when I did, I was hypnotized by it. I marvel at Roy’s ability to pick out the most subtle, yet the most deepest of emotions and thoughts and convey them through metaphors that are both ingeniously creative and simple. She brilliantly defines each character with their unique personality. The writing cuts through with sarcasm and insight, and tender descriptions. Her descriptions are intensely vivid, sometimes cruelly vivid. I think it was her writing that really brought the story closer to my heart. Some parts of the book - especially how the twins resolve their hollowed emotional angst, was a little hard for me to accept. I could empathize with their scars and the need to fill their void with love, but the Freudian theories of repression that Roy unravels, somehow didn’t hold water with me. Except for that quibble, the book has endeared itself nicely. The characters and the intense emotions pulsing through the book have been etched into my heart and memory.